Many of these items come in a variety of vibrant colors and neutral tones, so they’re perfect for every season, occasion, and personal style. And best of all, they go perfect with your Savvy Girl Golf purse! We can’t wait any longer…Let’s get right into it! 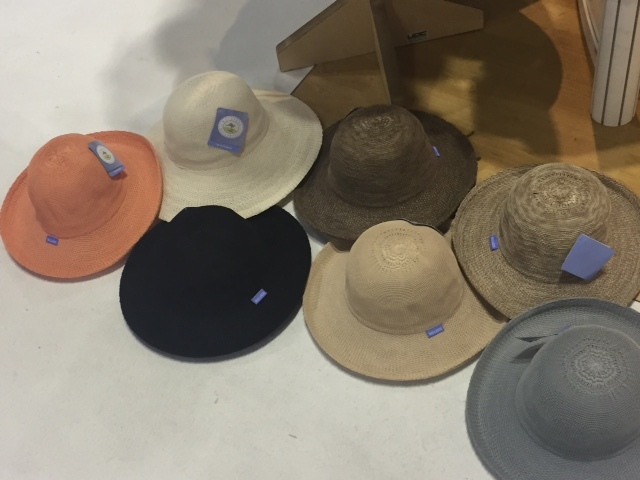 These Wallaroo hats are one of a kind. They’re perfect for keeping your eyes and face protected during those long, hot days on the course. And they keep you looking fashionable too. 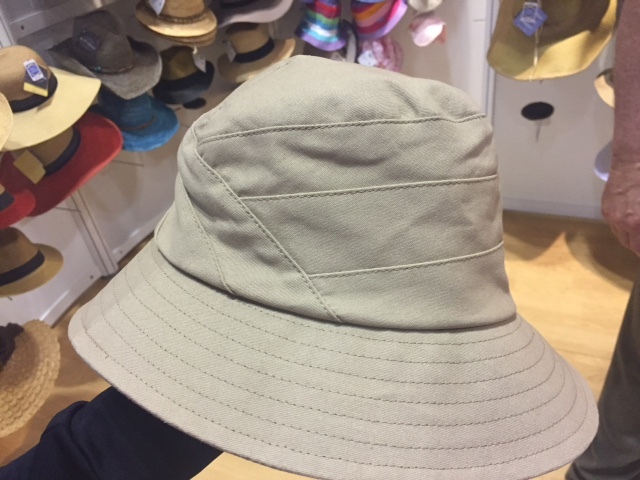 This bucket hat is one of our favorite styles. It’s simple, light, and sophisticated. The fabric is durable and doesn’t wrinkle, so it’s made to last. Deb loved their Pretty Women hat. And who wouldn’t?! It looks just like the one in the movie. If the owner wasn’t keeping track of Deb, she may have dashed off with it! They also had their Victoria Hats on display. 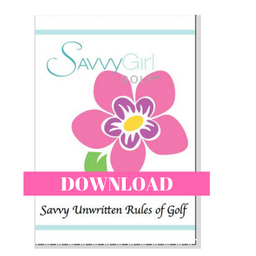 Their straw material makes them easy to fold and pack inside your Savvy Girl Golf Signature Purse. They’re available in 18 gorgeous colors. Here are some nice neutral shades that will match any outfit in your closet. Wear them on the course, on the beach, or while you’re tending the garden. Either way, you’ll stay cool and look fabulous. Robin is always a good sport! 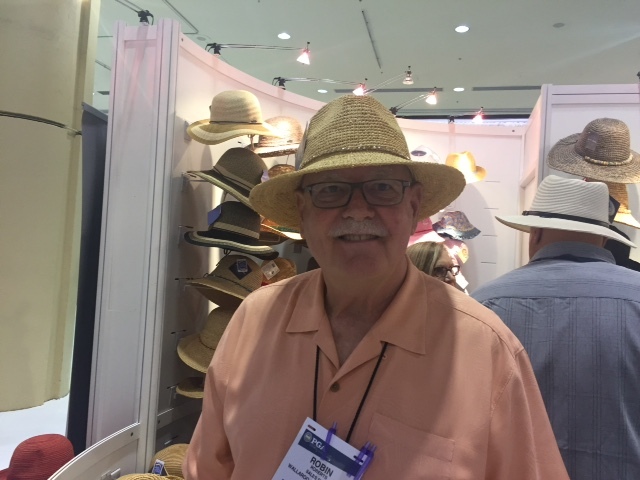 We asked him to model these hats for us, and he was up for the challenge. 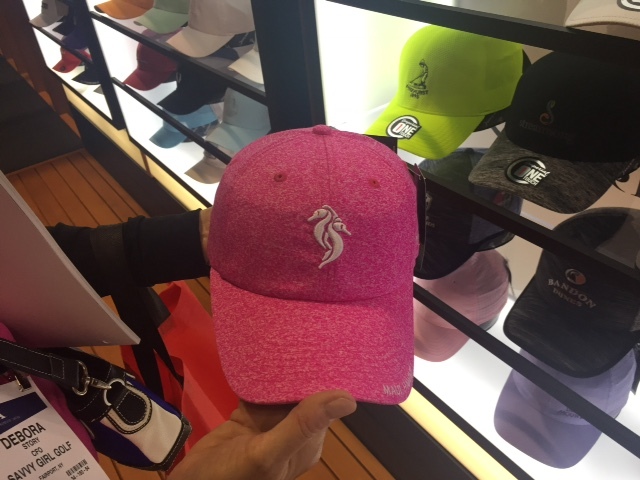 Whether you’re looking for the perfect baseball-type hat or a great gift for your favorite golfer, these trendy caps come in vibrant colors, and are made of durable fabric that conforms to your head, so you never have to worry about it sliding up your forehead during the 19th hole. 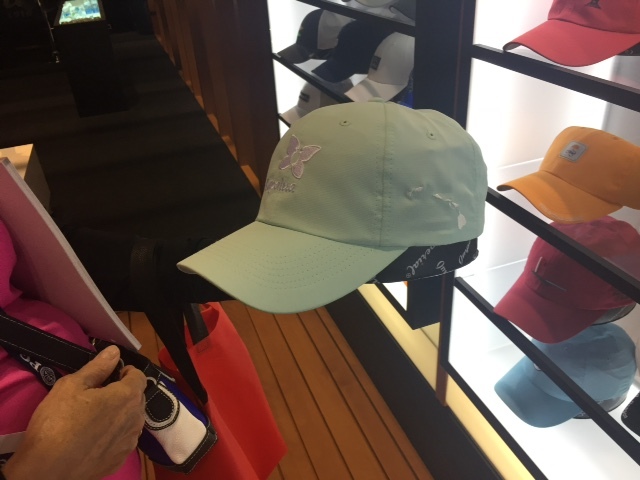 While at the show, we just had to check out the Coolcore caps that we included in last year’s PGA blog. Imperial states that these are “The Best Cooling Technology in Golf.” They are designed to keep you up to 30 percent cooler on the golf course. We love the way they look and their awesome pastel colors (sea foam and pink). We found this great gem too. It’s part of their new line and is made of heathered fabric. This hat is called the Reactor and is available in teal, fuchsia, frost gray, navy, and neon orange. purses and our logo! 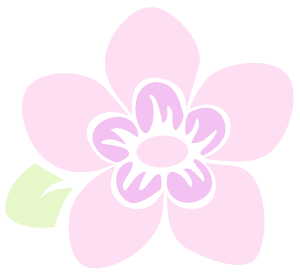 They also come in white with lime, lavender, or pink trim. It’s easy to see why these are part of this year’s”best of” list. Our readers may be wondering why the heck we included these on our list. 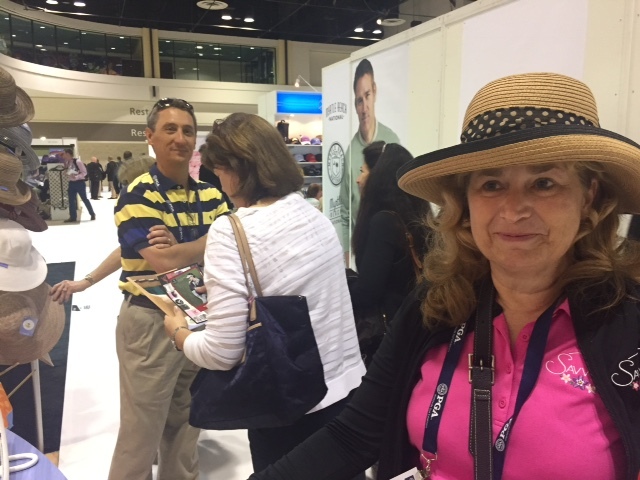 Well, we wanted to show off all the diverse vendors and merchandise that you see at the PGA event. 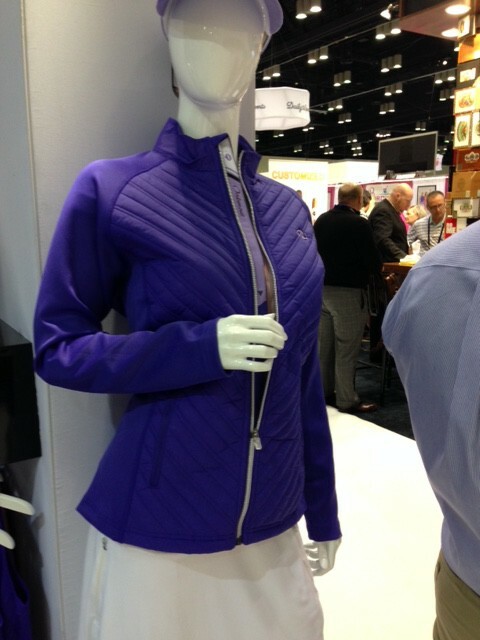 And we also wanted to remind our readers that great golf gear includes what you see (and also what you don’t see). It’s important to have quality clothing that keeps you cool, flexible, and comfortable, so you can concentrate on your game. That means your underwear needs to do this too! 2Undr is known for reducing chaffing and helping guys feel less”restricted” when playing sports. We weren’t surprised to see this type of merchandise at the show, but we did wonder where the ladies’ versions were! Let’s hope we see some great options for women at next year’s event! We fell in love with this poncho. It’s cool, comfortable, and super roomy. 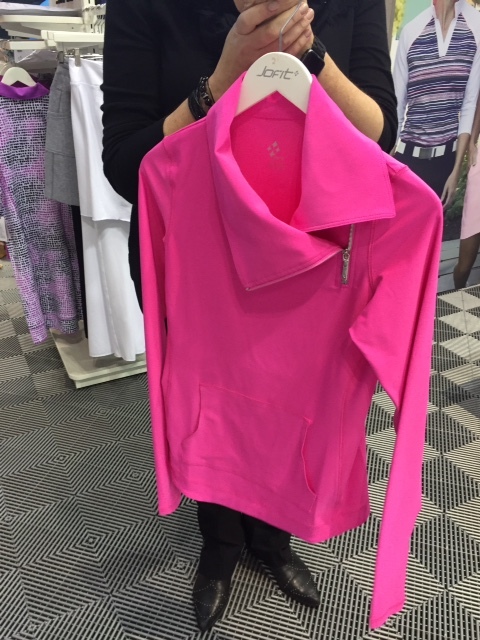 And the bonus is…it has sleeves! We love its neckline too. 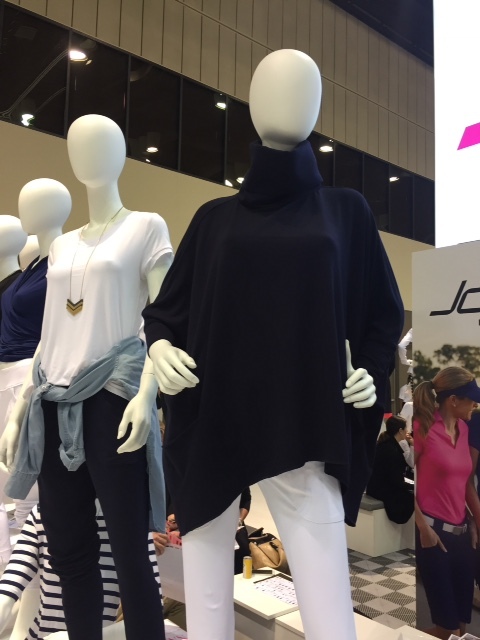 It’s so stylish and perfect for a night out or on the 19th hole! But you’ll have to wait until next fall to get your own. This one has a great neckline too! Sleek and perfect for outdoor weather. And the neutral color really compliments the whole look. This jacket may just be the perfect fit and style for every body type out there. The vibrant color is gorgeous too! 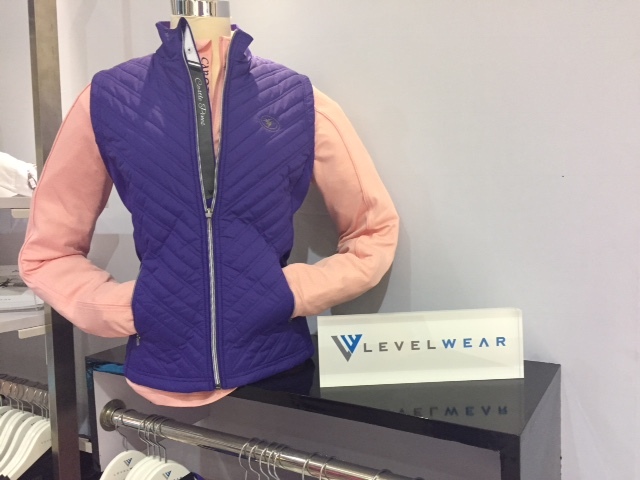 Another one of our favorite jackets comes from Levelwear. We loved this purple one! The length and shape of the jacket help compliment your figure and accent your curves. It’s super sporty and is sure to invite compliments. 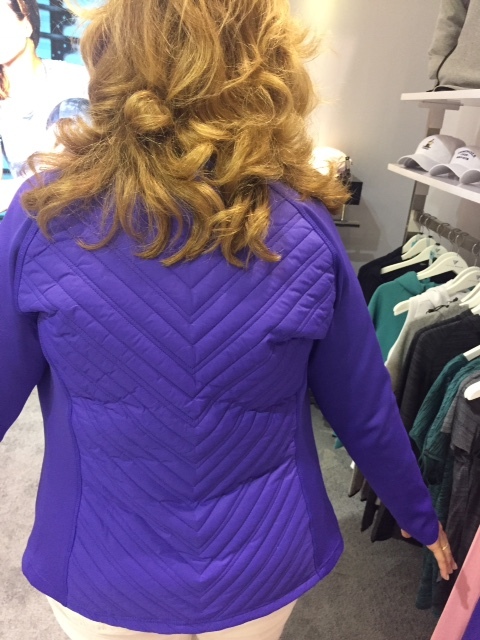 We loved this jacket so much that we just had to show you the back too! It’s definitely a must-have item in 2017. Check out this sleeveless version. This is perfect for the early spring and fall seasons. 6. 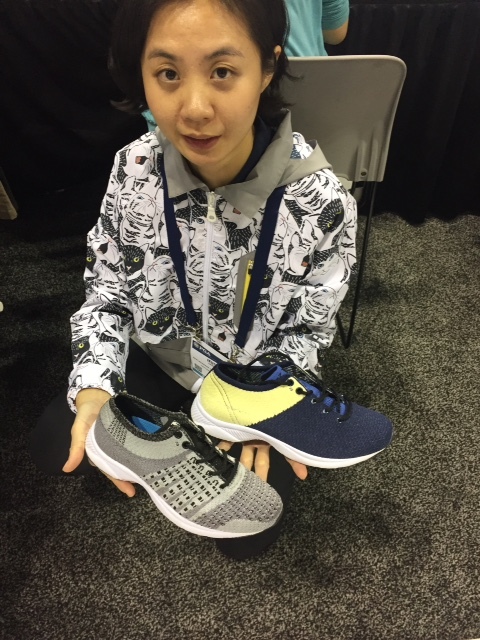 After spending some time near the manufacturers at the event, we met several lovely women who make their own custom shoes and clothing! 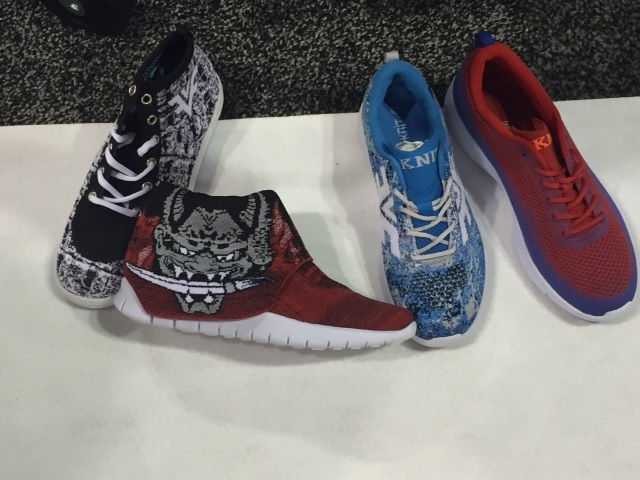 This got us thinking…should we or shouldn’t we design our own line of Savvy Girl Golf shoes? Mmmm, this may be something worth considering. We’d love to hear what our readers think! Deb tried on a few pair of these shoes and couldn’t believe how comfy there were. We also liked their creative designs and mixing of color patterns. That completes this year’s “best of” list! We hope you enjoyed viewing these incredible golf-inspired goodies and that you’re able to add one or two of them to your own collection soon. 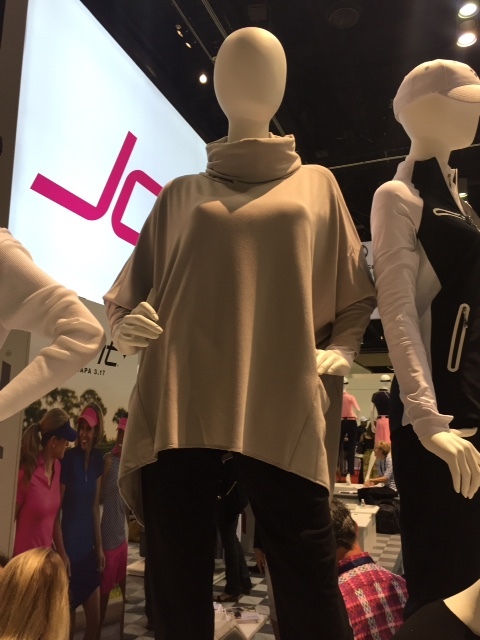 But before we go, we wanted to tell you about one more person we ran into at the PGA Merchandise Show. On the right is Bella Dovhey at the Just 4 Golf booth. She is a remarkable 9-year-old girl, who is not only a 3-time junior golf world champion, but she also writes for a golf magazine. She has interviewed golf legends like Arnie Palmer and includes features about them in her column in Southern Golf Central magazine. 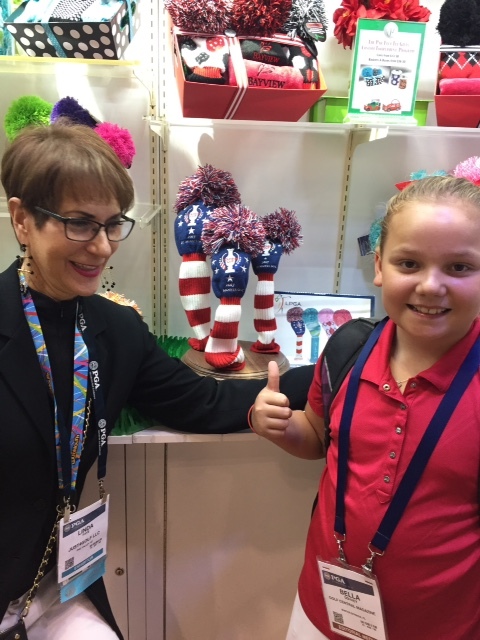 Bella is pictured here with Linda (left) from Just 4 Golf. They both were a delight! If you do shoes. PLEASE make them in other widths besides Medium!! And please have a reasonable price point.